Name: Rockport-Fulton Night with the Hooks! Enjoy Rockport-Fulton Night with the Hooks! Join the Rockport-Fulton Chamber of Commerce for the 2019 Season Opener of the Corpus Christi Hooks against the Amarillo Sod Poodles at Whataburger Field. Game starts at 6:15 p.m.
Plan on coming early for pre-game fun and activities beginning at 5:15 p.m. Our very own Chairman of the Board, Jatin Bhakta will throw the ceremonial first pitch. 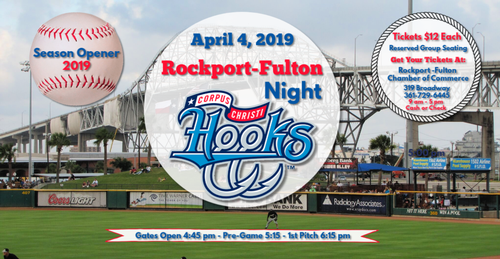 Don't miss this great opportunity to represent Rockport-Fulton while enjoying an exciting night of baseball, activities and loads of fun with the Corpus Christi Hooks. Our own RFHS Choir & Band, NJROTC, Little Leaguers and Little Bay Sea Queens will also be representing Rockport-Fulton at Whataburger Field! Come out and have a night of fun! To purchase your tickets, stop by the Rockport-Fulton Chamber of Commerce, 319 Broadway, Rockport, TX 78382. Get your tickets during business hours, Mon-Fri, 9 am - 5 pm or Saturday, 9 am - 2 pm. Payment via cash or check only please. Tickets cost $12 each for special reserved seats in sections 124 and 125 located behind first base. Tickets can only be purchased at the Chamber, 319 Broadway St.
Monday thru Friday 9 am until 5 pm and Saturday 9 am - 2pm. Bring your friends and spread the word!